As you know Filelinked has became one of the most used app on Android TV devices like Amazon Fire devices, Mi boxes, Nvidia Shield and etc. You can find many Filelinked codes using Google and YouTube easily. With the help of those code you can setup or Android TV easily. Those code comes with Android apps mainly used on Android TV. You may be curious about what this app does and how it looks and function. Many people used to search those app on YouTube or Google and try to get some understanding about the app whether it will be useful to you or not. Instead of manually searching and watching video tutorials about apps you don’t know Filelinked has added a feature for that. In this article we are going to discuss about that feature. You can see video on how this feature actually works. In the latest version of the Filelinked Apk you may have seen the question mark (?) near app download icon. If not download the latest version here. Don't worry if you already doesn't see that icon even though you have the latest version of filelinked app. It is because Filelinked code creator does not include the Tutorial links. Try this code - 16248134 . Click on question mark as shown on above picture. Open that link on any web browser or using YouTube app to watch video. You may have 2 options depending on the device you are using. Some may have one option and some will have both options available. If you have install Filelinked app on Android TV device like Nvidia shield and you want to watch video tutorial on your phone then this option is handy. 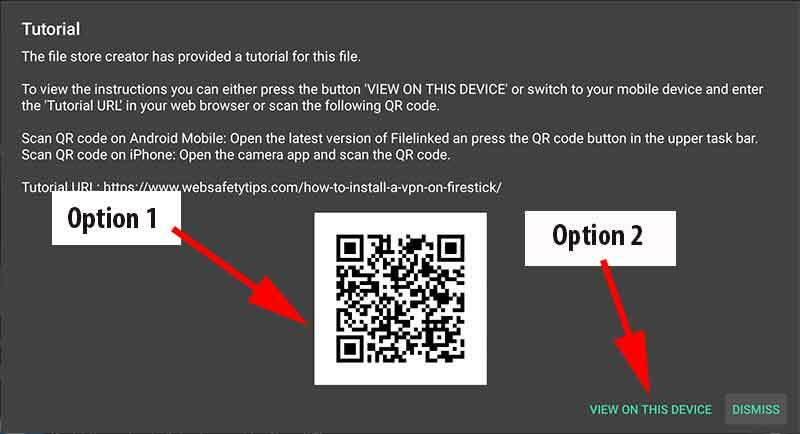 Instead of typing video URL manually on your phone you can easily scan QR Code and watch that video on your smart phone. For this you may need Filelinked app install on your Android phone. Once you have install Filelinked app open it. You may see square icon on top right corner of your screen. See below picture for more information. Click on that icon and scan QR Code. For those who use iPhones just open your Camera and scan it. Make sure to enable "Scan QR codes" on camera settings. For this option (View on This device) you may need Web browser or YouTube app installed. If so you can watch video tutorial related to each file easily by clicking a button. This entry was posted in FileLinked and tagged Filelinked, filelinked app, filelinked video tutorial. Bookmark the permalink. ← What is FileLinked and How it Work ?